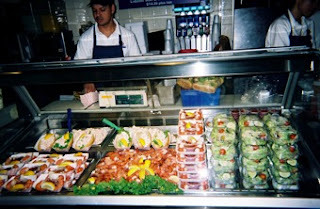 Seafood is my favourite, and at quincy market you can get fish, crustacaens, and shellfish prepared in every possible way. But who can resist this. Freshly baked rolls with a salad made from mayonnaise, finely chopped celery, and a generous amount of lobster meat. Or freshly boiled prawns served with a strong tomato dipping sauce. I could not help myself. The prawns were scrumptious - delicious.